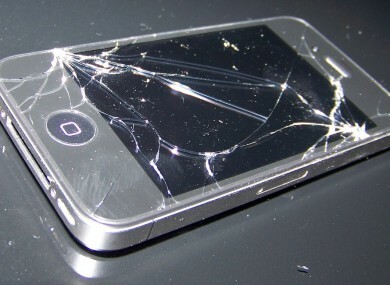 A smashed screen is usually one of the biggest fears of any user, but how often does it happen? WHEN GETTING A new smartphone (or any device for that matter), it’s easy to become conscious that you’re carrying around what is an expensive and valuable device. With high-end smartphones costing well over €500, it means that you will take greater care of it. Yet accidents happen, screens are broken, devices become faulty and sometimes bad luck can result in your phone being stolen. Because of this, most of us opt for whatever insurance is being offered by our provider without much thought, but this can be problematic. If something happens in the space of a few months, it’s a bargain, but if nothing happens for the two/three years you have the phone, it’s a waste of money. So with all of that in mind, what should you take into consideration, and is it worth getting? - What am I protected against? - What’s the cost on top of my bill? - What situations aren’t covered? - What’s the cooling-off period? The four big ones that you would need to consider is loss, theft, malfunction and accidental damage. Practically all insurance covers theft – that is your phone is stolen while it’s on you – but even then, you need to pay close attention to the terms and conditions for making a claim, and what’s not allowed. On the surface, a policy might advertise that your phone is covered under things like theft or damage, but looking beyond that will normally uncover a number of conditions that could easily rule you out. For example, the definition of theft usually involves your phone being concealed and reasonably protected so if, for example, you’re in the pub and you leave your phone on the table and it’s taken, then you’re not covered since you didn’t properly conceal it. The same principle goes for your phone being stolen from your car, if it’s not in a locked glove compartment or boot, you’re not covered. It’s also likely you will have to pay extra to cover additional situations like accidental loss, which brings us to the next point. What’s the cost on top of my bill? While the options can appear cheap at first glance, remember that the cheapest options apply to low-range phones. If you have a relatively new phone, you’re going to be looking at the higher end of the price scale. All insurance claims include an excess cost. The first time a phone is stolen, this can cost between €30 – €60 depending on the policy you have. If the phone is stolen a second time within the space of twelve months, it will usually be double the first excess cost. Add that on top of a monthly premium, which can be as much as €168 per annum, and your usual bill and you have a plan that could easily burn a hole in your pocket. One of the most important things to check before committing to a policy is knowing what you’re not covered under. As mentioned earlier, the definition of theft can be pretty specific, and unless you look in the terms and conditions, you won’t know exactly what your rights are in a situation. All of the major providers have their terms and conditions online and while it’s probably safe to assume you’re not going to read the whole thing, there is one major advantage of it being available there: wordsearch. In this case, Ctrl + F (or Cmd + F if you’re a Mac user) is your friend here and searching for ‘exclusions’ usually brings up the many situations you’re not covered under. The cooling-off period, the length of time you have to cancel your insurance contract, may seem arbitrary, but if you want to break off a deal, then . Depending on the policy on offer, this can range from 14 – 60 days depending on the provider you’re dealing with, allowing you to cancel your policy without charge. After that, you will have to pay a fee to break the contract. By far the easiest way to get your phone insured, all network providers have their own insurance policy. You don’t really have much choice if you do decide to go down this route. Just remember that if you decide to purchase insurance after you bought your phone, the policy won’t come into effect until 30-60 days after your insurance policy started. All providers below allow up to two claims made per year. In terms of coverage, things stay roughly the same as the mobile providers mentioned above except there are two major differences. The monthly cost and the excess charge can be less in some cases, but in most cases, you won’t be covered for the first 30 days your policy is active. The second is that the majority of third-party providers offer gadget insurance instead of just phone insurance. This can be useful if you want to insure more than one device and can cover them under the same policy, but if you’re only thinking of insuring your smartphone, then its use is limited. In the case of gadget insurance, there’s usually a maximum valuation you can give a device which, again, is useful if you want to insure numerous devices like tablets and handheld consoles. What’s covered: Accidental damage (theft and loss covered by more expensive premiums). If you happen to have house insurance, then you could be able to insure your phone under their selected items policy. The premium and range of cover varies between the different insurers, but it generally works out cheaper than traditional phone insurance since it’s an extension of your home insurance. The only caveat is while it’s cheap, if your phone does get stolen, it could potentially bump up your premium. There are two cases in which this will happen. The first is if you break it accidentally such as dropping the phone on the ground or if a part of your phone becomes faulty, through no fault of your own. If you break it, some insurance policies will offer you a replacement or repair, although they’re quite specific about what qualifies and what doesn’t – again check the exclusions to see what’s covered. In the case of the device be your warranty, which covers you if there’s a problem with the phone that is a fault of the manufacturer and not your own. Under EU consumer laws, your warranty covers a two year period which covers repairs and such. Unless you have a high range smartphone, then it’s hard to argue for it. While some policies are better than others, all insurance providers end up offering a number of loopholes that mean the only time you would rely on it is if it was stolen. While thefts do happen, most of them occur because of the owner not taking the proper precautions in the first place. The best policy you can adapt is ones that keep your phone safe at all times. Apply common sense and keep your phone hidden, invest in a case so you don’t damage it if you accidentally drop it, and above all, don’t make it easy for someone to steal it. Keep it hidden, don’t display it in a public place for everyone to see and if you’re are taking a call in a public space, be aware of your surroundings. Ultimately, it’s comes down to whether insurance will give you peace of mind, regardless of whether you’re the victim of theft or not. Just don’t opt for a policy on a whim. Email “Is getting phone insurance even worth it?”. Feedback on “Is getting phone insurance even worth it?”.